It was 1982, but it might as well have been 1952. I was a ten year old boy in suburban Columbia, South Carolina, but it could have just as easily been Kansas City, or Sacramento, or Buffalo. I was a member of perhaps the last generation of American kids to have the freedom to run free for hours on end with no adult supervision. Even then, the nightly news carried ominous reports, which would strip future generations of that time-honored tradition of carefree play. A series of grisly child murders had recently taken place in Atlanta. John Walsh’s son, Adam, had been abducted and murdered the previous year. Etan Patz, a kid my age from New York, had disappeared a few years before, leading to the ubiquitous photos of missing children on milk cartons. Times were changing, but in the still idyllic world of my youth, we roamed free. And when not sleeping or eating or in school, I was outside. I wore Toughskins jeans with patches on the knees. My friends and I played basketball and football and baseball in backyards all over the neighborhood. We played the violently titled “kill the man with the football”, aka “smear the queer” (we were young, and blissfully unaware of what queer even meant, but we knew we had to run like hell when we got the ball). We played “war” – similar to hide and go seek but with a vague adolescent bloodlust – and we would alternately practice the arts of hunt and evasion – stalking and hiding, hiding and stalking. We would tote bb guns into the nearby woods, where we shot rusted Pabst Blue Ribbon cans discarded by furtively partying high school kids. But when we weren’t doing these things, we were riding our bikes. My best friend back then was Lee Pitts. His dad and my dad had gone to the old Columbia High School together and had remained friends over the years, eventually purchasing homes in the same neighborhood. Our back yards were separated by a run of chain link fence, which one of us was always jumping to get to the other’s house. We lived in Briarwood – a solid middle-class neighborhood situated off of U.S. Highway 1, which runs from Maine to Florida, but in Columbia is called Two Notch Road, because way back when – when it was an Indian trail – it was marked by two notches in the trees. At least that was the story we always heard. We knew practically everyone in the neighborhood, with one notable exception of the grumpy, solitary old German lady who lived next door to my family’s house on Weybourne Way. Whenever a stray football or baseball would find it’s way into her yard – which admittedly happened frequently – she would scowl at us, uttering something guttural and indecipherable, and abruptly release her yappy, wire-haired Dachshund who would run toward the errant ball in a barking frenzy. Sometimes we retrieved the ball and scampered back to safety before the yapping beast arrived, sometimes we didn’t. We learned at an early age that discretion is the better part of valor. When we couldn’t round up enough guys to get a football game going, or when the football was held captive by the German, Lee and I would set out on our bikes. On weekends, we would ride for hours, all over the neighborhood – up to Windsor Elementary (our school), over to E.L. Wright Middle School (where the “big kids” went), and we would roar at devil-may-care speeds down the long hill of Highgate Road. We explored every inch of that neighborhood, which led us one day to an over-grown back corner of the development at the end of Highgate. There was a sad little trickle of water there, which ran into a culvert. It was nearly covered over with cattails and brambles, and had this interesting aroma. Actually, it quite stunk. We called it Sabotage Creek. To the left bank of the creek was a thin strip of sandy trail, meandering beguilingly off into the scrub oaks and heat-stunted pines. We didn’t know where it went, but as soon as we saw it, we knew we had to find out. 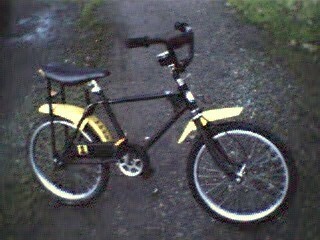 My bike was an early 80’s model Sears Free-Spirit – black frame with yellow trim and knobby tires – an all-purpose kid’s ride with the heart of a mountain bike, long before mountain bikes were even widely known or commercially available. It was my go-anywhere bike, and there was an unmistakable sense of freedom when riding it. Exploring uncharted trails in the fresh air, free of parental supervision – it was heady stuff. We followed that thin strip of sandy path for miles, not knowing exactly where it would end up, and with no real expectation in mind, other than simply exploring. At one point we stumbled upon an old family cemetery of a dozen or so humble stone markers with weathered engravings, some dating back to the 1890’s. Even at the age of ten, I had inherited my father’s great love of history, and I was fascinated that people had once lived in this seemingly remote place. I wondered who they were and what their life was like, and the cemetery deepened the mystery and adventure of our exploration. After more peddling, which seemed monumental in scope at the time, but was probably not more than three or four miles, we eventually discovered that the trail led to an obscure and little-used fire road, which led in turn to Sesqui-Centennial State Park. “Sesqui”, as we called it, is located just a few miles north of Briarwood on Two Notch Road. We had been there many times, but were elated to discover that it could be reached through little-known trails under our own power. Admittedly, we were not Lewis and Clark, but we felt pretty good about our discovery, nonetheless. I remember riding around Sesqui for a little while and then heading back home. As we pedaled back down the now-familiar trail, past the intriguing family cemetery, Sabotage Creek and on toward home, I remember feeling tired, slightly sunburned and maybe a little saddle-weary. Beyond those things though, I remember the feeling of adventure – of knowing that my legs could carry me to places I never even knew existed. It was a feeling of freedom and though I had no way of knowing it then, I had begun a lifelong addiction. Sometimes even now when I’m on my mountain bike, I think about that ten-year old kid and I’m thankful that he had the opportunity to play and explore and discover. I’m thankful for hidden paths and the mysteries of trees and forgotten history waiting to be rediscovered. And I can’t wait to see what’s around the next bend in the trail. ← USADA – Proof that we no longer reside in a Democracy?